This declaration, signed by election-method experts from around the world, publicly denounces the use of plurality voting – also called First Past the Post – in governmental elections. Plurality voting suffers from major flaws, including the risk of vote splitting. To avoid this risk, voters focus on only two dominant candidates and ignore other candidates they prefer. As replacements for plurality voting, this declaration recommends four significantly fairer election methods: Approval voting, most of the Condorcet methods, Majority Judgment, and Range voting. These methods all replace plurality voting's primitive single-mark ballot with improved ballots that collect more information. 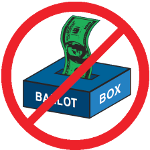 The signers take no agreed-upon position regarding the use of instant-runoff voting (IRV), which is also known as the Alternative Vote. Opinions differ on whether this method’s disadvantages outweigh its advantages. As a consequence of adopting fairer election methods, this declaration's signers expect many direct benefits in government. They also expect indirect economic and societal benefits, similar to the way the transition from monarchies to plurality-based democracies yielded dramatic long-term and widespread benefits. The signers of this declaration vary in political orientation, and believe the recommended election reforms will be fair to all, without bias that favors or opposes any particular political parties or groups. The signers urge broader discussion of the flaws of plurality voting and how the supported replacement methods eliminate those flaws. Private organizations can encourage this discussion by adopting one of the supported voting methods. Most significantly the signers believe that any government that still uses plurality voting in any election should immediately replace that inferior method with one of the declaration-supported election methods. You can read the full Declaration of Election-Method Reform Advocates here. You can view the signatures here. Please add your signature to this Declaration! © Copyright 2011 by the Election-Methods forum at www.electorama.com/em. Permission to print or distribute copies of this declaration (without signatures) is granted on the condition that it is not changed and this full copyright notice is included in every copy.